Greetings everyone! 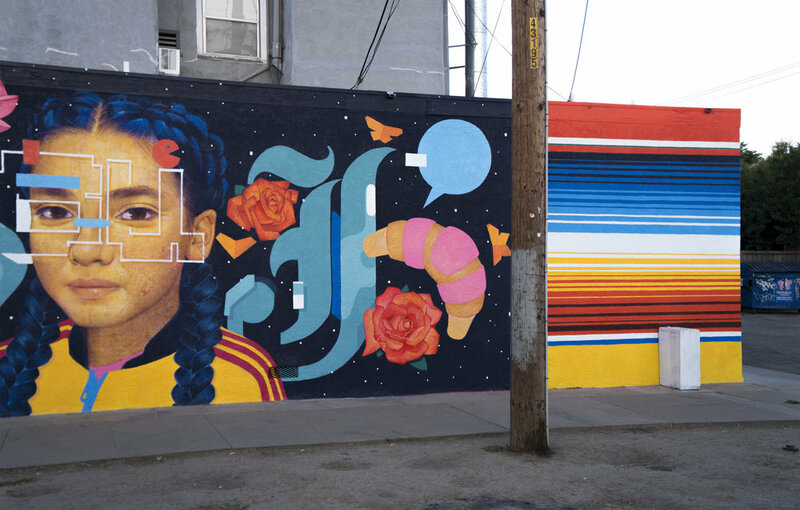 Here is a wall I recently completed in Los Angeles that I call 'Xochitl', the word for flower in Nauhatl (Aztec language). It is located on the corner of Commonwealth Av. & 6th Street in Koreatown. I will let you process the image on your own but will point out some hidden cues, there are two vague symbols throughout her face. In her neck area, the image for Xochitl or Flower, and in the center of her face, the Korean character for that same word. This is the highest mural I have done to date, and although this photo looks peaceful, the process was hectic because it was in an active construction zone on a busy intersection which meant there were lots of stalls and obstacles. I'm happy we finished in time, and that it came out well. If you are in L.A. please visit, the wall is across the street from the Superior Court.